John W. Daniels Jr., named one of the 50 most influential minority lawyers in America by the National Law Journal, believes when you value and empower people – “make them feel comfortable in their own skins” – you get their best efforts and the best results, from serving their communities to delivering excellent client service to building collegiality and encouraging a team approach to solving problems. ilwaukee attorney John W. Daniels Jr. has a busy and varied life. But if one were to attempt to distill his life philosophy into just two words, it might come down to these: Everybody counts. That’s a theme that runs through everything Daniels does, whether it’s working with his real estate law clients, or carrying out his management responsibilities as chair of Quarles & Brady LLP, or serving in numerous ways as a community leader. Conversely, many would argue that the city of Milwaukee and the legal profession are fortunate to have John Daniels. The people at the National Law Journal would agree. 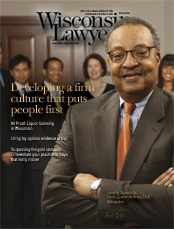 In May 2008, they picked him as one of the “50 Most Influential Minority Lawyers in America.” He’s the only Wisconsin attorney on the list. Indeed, Daniels’s career shows he measures up to those high standards. Growing up near 44th and Hampton in central Milwaukee, Daniels was the second oldest of eight children of working-class parents. He attended North Central College in Naperville, Ill., with his sights set on eventually studying medicine. A course in organic chemistry changed his mind, and he later diverted to the path he perhaps always was meant to follow. After finishing his bachelor’s degree in science and business in 1969, he earned a master’s degree in education at U.W.-Madison. That’s around the time he met a group of people from Harvard University who were striving to develop new ideas in educating disadvantaged children. Daniels liked their vision. He also noticed they held joint degrees in law and such fields as education or public policy. For Daniels, that clinched the notion of wanting to become a lawyer. He got into Harvard Law School, where he earned his J.D. in 1974. He saw law as a “vehicle to do other things,” he says. At Harvard, he took a course in commercial real estate law taught by Mort Zuckerman, a developer and later owner and publisher of the New York Daily News and editor-in-chief of U.S. News & World Report. “He was a real whiz,” Daniels recalls. “That course prompted my interest” in commercial real estate law. Daniels realized this was an area of the law that fit with his natural inclinations. He’d always liked solving problems and pulling together the various pieces of a project. Over the years, he’s applied his skills to several real estate projects in his hometown: the Midwest Airlines Center, the Bradley Sports Center, the Grand Avenue project, and a large redevelopment project on the U.W.-Milwaukee campus, to name a few. He’s also advised many major corporations – General Electric, Kraft Foods, and Xerox, among others – on their real estate projects around the country. After finishing law school, Daniels could have landed a job in any of several big cities, but two factors drew him back to Milwaukee. One was that both he and wife Irma had family members in Milwaukee. The other was meeting Mike Bolger, then with Quarles & Brady and now president of the Medical College of Wisconsin. Daniels joined Quarles & Brady in 1974 and was the first African-American attorney hired by the firm – and, for that matter, one of only a few in Milwaukee at the time. He’s been with Quarles & Brady ever since, making partner in 1981 and joining the firm’s management committee in 1994. In 2007, he became chair of the firm, which employs 450 attorneys and has its headquarters in Milwaukee, with additional offices in Madison, Chicago, Phoenix and Tucson, Ariz., and Naples, Fla. Still, Daniels acknowledges that grasping this concept requires lawyers to abandon some traditional ways of thinking about the legal profession and how to run a law firm. That type of people-centered approach creates a climate in which teamwork and collaboration can flourish, Daniels points out. Both are essential in today’s law firms, he contends, given clients’ complicated problems. It all circles back to the “everybody counts” philosophy Daniels has held his entire life. If law firms want to succeed in today’s world, they increasingly will adopt this line of thinking, he believes. Daniels’s accomplishments as an attorney, locally and nationally, are only part of his story. He’s also built a strong reputation as someone who cares deeply about Milwaukee. Various awards and honors have recognized his efforts for the city and its people. The Outstanding Community Leader Award from the Thurgood J. Marshall College Fund and the Humanitarian Award (to both John and Irma) from the St. Francis Children’s Center are just two examples. He also takes special pride in the people he works with at Quarles & Brady, whom Daniels describes as “a group of people who feel a personal commitment to me as an individual.” It means a lot to him, he explains, when they invest time and energy in community programs that matter to him. One well-known event that Daniels founded and chairs is his annual Fellowship Open golf tournament. The name signals his intent. “What I like about it is that we get people from all different ethnic backgrounds out there,” he says. “There’s a lot of isolation in this community. Any time you break down that isolation, people start to think differently” about each other. Still, Daniels points out, there’s an abundance of golf tournaments that raise money for various causes. He wanted his event to differ in a couple of key ways. For one, he aims to help organizations that often get overlooked in typical community fundraising efforts. With that chance for personal connection, the kids feel involved, even honored, at the event, Daniels says. For most, that kind of contact with successful people, of diverse backgrounds, is otherwise unheard of in their lives. “I think sometimes people who have more assets don’t understand how hard it is for kids like these to dream,” he says. Clearly, Daniels is well aware of the opportunities life has given him. And he’s never forgotten one of his major reasons for wanting to become a lawyer in the first place: to make a difference in his community. Dianne Molvig operates Access Information Service, a Madison writing and editing service. She is a frequent contributor to area and national publications.